The pride of Cagayan de Oro City, undefeated “Prince” Albert Pagara is about to set his mighty fist in the ring against Mexican Raul Hirales in the “Pinoy Pride 28: History in the Making” at the Waterfront Cebu Hotel and Casino on November 15, 2014. The 20-year-old Inter-Continental Bantamweight title holder who has the record of 21W-0-0 and 15KO’s is getting ready as his fight is fast approaching. “I am conditioning my body for the fight by focusing on my training, and working on my power,” the future boxing star disclosed. Pagara added that his upcoming fight is really important for him because he will be defending his belt. “This is an important fight for me since I will be defending my belt and I won’t allow that my belt will be taken away from me,” he shared. 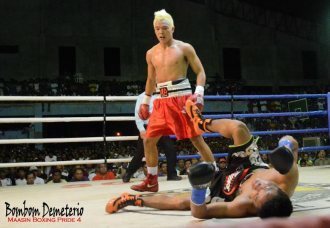 Philippine Boxing “Prince” who was encouraged by his father to be active in boxing is looking forward to set another KO record during his upcoming fight. “I am almost in my 100% prepared self, yet I still need some polishing. I will try my best so the fans will witness another KO for this fight,” Pagara added. Moreover, “Prince” who wanted to set a record same as his idol Prince Naseem Hamed, is very grateful to the people around him who keep on supporting and helping him all throughout his boxing career.